Coming to the last day of the Kootu series in this Blogging Marathon. 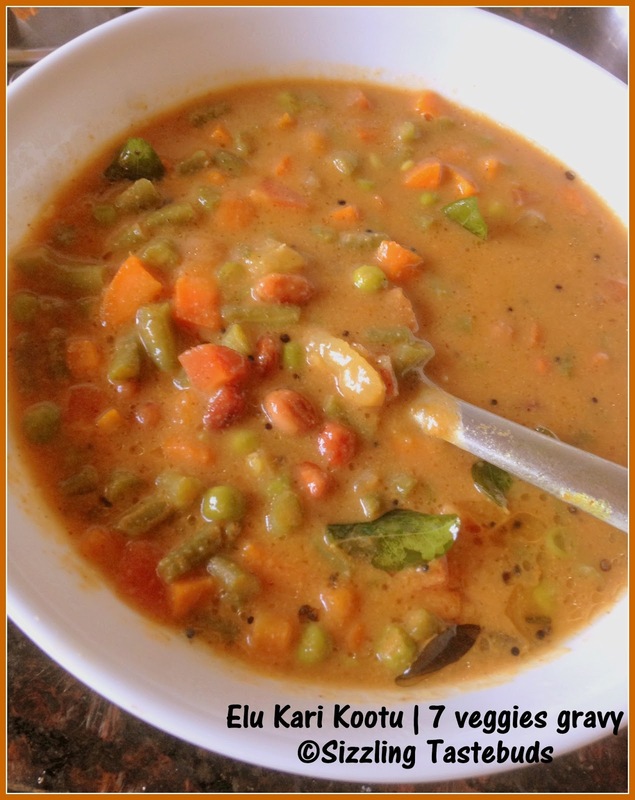 After Karamani Kootu, Podalangai Poricha Kootu, today's dish Ezhu Kari Kootu (Tamil : Ezhu - 7, Kari - vegetables or gravy made with 7 veggies) is made expecially for Pongal (Tamil Harvert Festival) to celebrate the harvest season. Traditionally, it uses most of the fresh harvest and is spiced in a mild gravy. Pairs amazingly well with Hot rice and Tomato Rasam. Although it doesnt use Onion or Garlic , as its made for a festival, its spice comes from Green chillies. In my house however, we prefer red chillies.. Note: I have mentioned the 7 veggies that go into this gravy. Feel free to add or leave out any more that you wish to. Wash, peel / string and chop all veggies to equal size. Soak Moong dal for 10 mins in warm water. In a large pot, bring about 3 -4 cups of water to a rolling boil. Add a pinch of salt and the chopped veggies and cook for 8- 10 mins till al dente. Pressure cook Moong dal for 1 whistle with turmeric. Cool. In a pan, add oil, prepare the tempering. Add the masala paste, fry till oil separates. Add salt and boiled veggies. Let it simmer further for 3 -4 mins covered. Once done, serve with hot rice and Tomato Rasam. Kootu is one thing I really want to make more often. I love the vegetable combination in your dish. I want to dip some rotis in it & have them now. That seriously looks delicious Kalyani..This was one of the reasons why I opted to have this theme, there are so many variations we are yet to try right. I have heard so much about this gravy, never made it myself as there is a different culture followed during Pongal..very nice to read about this..thanks for documenting such old treasures..
Looks delicious. I know nowadays we can go with whatever we have in hand but are these preferred vegetables traditionally for this kootu? Suma - this is due to the Principal's (read Valli's strict) instructions that the theme was Tamilnadu Kootus. posting a Karnataka / Bangalore Kootus would have meant Fail in exams :-)) Lol !! yes, Suma. These are the preferred veggies. Only for Yam (as some people might have itching / allergy), you can substitute with some other suitable veggie. What a delicious kootu Kalyani. All those veggies make this a very filling and healthy dish. Will try soon. Wanted to make this during Pongal but missed it. The kootu looks very delicious. I had bookmarked this kootu from elsewhere..I was very impressed with this kootu. Love the tradition attached to this kootu! We also make a variation of this kootu for pongal.